Here’s your complete James River fishing guide in about 500 words. The James is two rivers: the portion upstream from Richmond’s 14th Street Bridge, and the portion downstream. This is because the Fall Line – the farthest upstream place where the Atlantic Ocean’s tides reach and rise and fall – is directly below the 14th Street Bridge. Stand on the bridge and look upstream and you’ll see a free-flowing, rocky, smallmouth bass river; look downstream and you’ll see a flatwater tidal smorgasbord in which all sorts of things swim. The big predators in the Upstream James are mainly flathead catfish. Although they get bigger, a 20-pounder is a trophy. The go-to method for catching them is to swim a live bait (small bluegill work well) in deep holes. The big predators in the Downstream James are mainly blue catfish. The current record – set in 2009 - is 102 pounds, and several fish over 50 pounds are caught every week throughout the year. Use fresh cut bait (various species of the shad family) in deep holes, on shallow flats, along dropoffs, and all sorts of other places. 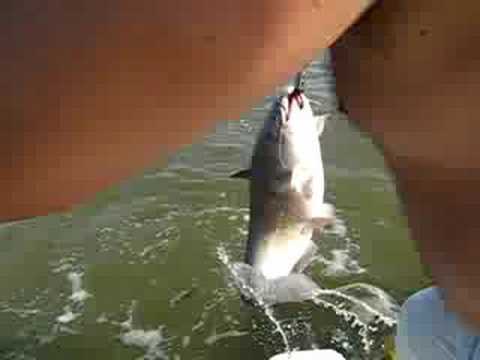 The river is full of blue catfish, and if you keep trying different locations, you’ll find some. Fish for an hour, then change locations. The premier gamefish Upstream is the smallmouth bass – averaging a little less than a pound, with a three-pounder considered a big one, and a five-pounder a real trophy. There are two main smallmouth-catching methods during the warm months (May through November): small, noisy, topwater lures across current near deep pools; and soft plastics (grubs and tubes) drifted along the bottom in medium currents (use browns and greens). Or, if you can get them, even better are live crawfish. During the cold months you have to slow down with just two methods: soft plastics fished creepingly slowly, and live minnows fished dead-still in deep holes. The premier gamefish Downstream is the largemouth bass – averaging a pound or more, with a five-pounder considered a big one, and a seven-pounder a real trophy. Just about any sort of bass lure you can find will catch James River largemouths. But if you had to stick with just two methods during the warm months, they'd be these: small crankbaits in shad and chartreuse colors near shorelines and cover; and four-inch plastic worms (dark colors) around structure such as pilings, docks, jetties, logs, and fallen trees. The same two techniques work during the cold months, but add to the list fishing jigs and tubes on shoreline and creek channel dropoffs. The James River's 400 miles have a single very best fishing location at a single time of the year: downtown Richmond in April. That's when and where the hickory shad, American Shad, white perch, and stripers congregate on their upstream spawning runs. On April weekends there are many, many boat and shoreline anglers casting lines – so, unless you like elbows, fish on a weekday. For the shad, throw tiny gold and silver spoons; for the white perch throw tiny (16th-ounce) white and chartreuse grubs; and use big white grubs and big topwaters for stripers (up to five pounds). For the jumbo stripers (up to 30 pounds) use fresh cut shad. The James River of course has many more fishing methods and varieties. There are two best ways to learn about them: ask at local tackle shops, and ask on-the-water anglers. John Bryan has written extensively about fishing. He lives near the James River in Richmond and can be reached via e-mail to discuss fishing: jbryanfish@aol.com.